They came from Pakistan and Syria, the four refugees I met in Mytilene, a small city on the east coast of Greece, on the island of Lesbos. The conference I was attending in May was hosted by the International Small Islands Association and focused, a bit ironically, on the topic of islands and utopia. For many, the “Greek Islands” conjures an image of Utopia — and I can tell you that for visitors like myself, they are. A slightly closer look, however, revealed something less than utopic: plastic pollution. It is found on every Greek island, Lesbos included. Indeed, especially Lesbos, which is a primary landing point for climate and war refugees from Syria, Pakistan, Afghanistan, Somalia and other African nations. While I was there, Mytilene refugee camp coordinators were hearing rumors of two boats full of people who risked everything to escape the dire circumstances which make up their lives. One of the Safe Passage bags, made by refugees from life ­jacket material found on Lesbos beaches. Shoheb, a 19-year-old refugee fleeing his family home in Pakistan, works on the Safe Passages bag project. Refugees from Syria and Pakistan, with volunteer supporters (Lena Altinoglou is third from right). PPC Artist Ally Pam Longobardi sifts through waste materials collected by refugees on Lesbos. Longobardi at work sorting plastic trash and driftwood with a camp resident. The refugees I met are among the 1.5 million who have fled to Greece, most of them traveling by inflatable boats from Turkey, of which 50,000 landed in Lesbos alone. Many of the refugees who arrived at the height of the migration have gone elsewhere by now; some extradited back to where they came from. Some are now documented — but not sure where they’ll go next. Many are in a holding pattern while they are in Mytilene, awaiting permission to travel to Italy and to other European countries. A special group of four documented refugees I met found work in a new small business: producing bags, purses, and other items for sale to support the refugee camps in which they live. Last year, at the height of the migration to Lesbos, plastic trash had quite literally inundated the shorelines of this beautiful island. Some refugees who find themselves here for months have already begun looking for ways to work and contribute to the camp. A few decided to begin picking up the plastic trash that was inundating the shores. During the crush of the influx of refugees, the waste was primarily life jackets — thousands of them — and deflated boats, as well as plastic water bottles and all manner of plastic trash related to their journey — on top of the plastic pollution already washing up. to clear the beautiful Aegean waters of the pollution to which their own unfortunate circumstances added. Plastic and other pollution at the high tide line. “There was so much marine trash,” said Greek volunteer Lena Altinoglou, that “those [refugees] who have been here longer had the idea to begin making the bags.” With these resources now at hand, camp supporters sought donations for sewing machines and other supplies. A local professional helped them design the bags, with an eye toward aesthetics and durability. Those now participating in the project hope that if they can make money, they might stay here in Lesbos, recycling the trash, as well as creating work with their own hands that will contribute to their own sustenance and that of the camp and the wider community. 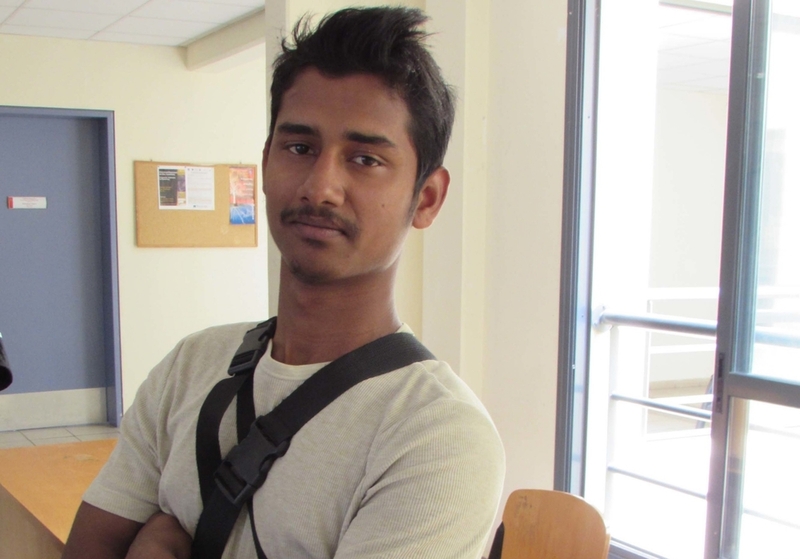 Shoheb, a 19-year-old from Bangladesh who emigrated alone from his family home in Pakistan, is staying at the camp on Lesbos for now. Asked where he was ultimately heading, he said he didn’t really know. “But if there is a place I can work and live, I will stay there.” He is not currently planning to move further north. Instead, he is learning to read and write in Greek. Shoheb’s fellow camp residents are among those who will be taught by volunteers to read and write in English. For now, they too are staying, and now they have work: designing and creating these bags by hand, and selling them and other items made from the life vests and plastic pollution that they have picked up on the shores of Lesbos. Asked whether he has been able to find friends at the camp, Shoheb looked around at the others, grinned, and said “yes, I have friends.” Putting her arm around him warmly, Lena, the Greek volunteer, said “yes, we are going to keep him here.” For the first time, I saw Shoheb really smile. The following day, visual artist and PPC Artist Ally Pam Longobardi performed a special intervention at one of the remaining refugee camps on Lesbos. I had the fortune of accompanying her and photographing the workshop designed for the adolescents living at the location. Our initial contact, Australian volunteer Rachel Mackie, not only gained the needed permissions in advance of our arrival, but also led adolescents from this camp on a beach clean-up. The children collected the usual plastic water bottles, straws, fishing nets, Styrofoam and other island detritus. But they also gathered some of Lesbos’ new quotidian finds: shredded plastic boats and rafts, life jackets and pool floaties, shoes and flip-flops, scraps of reflective thermal blankets — remnants of the harrowing journeys of over 500,000 migrants on Lesbos alone. Each of the children we met, none older than 19, had travelled alone and is, for now, finding a new home among fellow refugees and dedicated aid workers from organizations such as Save the Children, Doctors Without Borders, and many others from around the world. Several hours later, the camp’s main structure donned hanging sculptures and garlands strung over an entrance way. There was a single stand-alone piece, shaped as a boat. 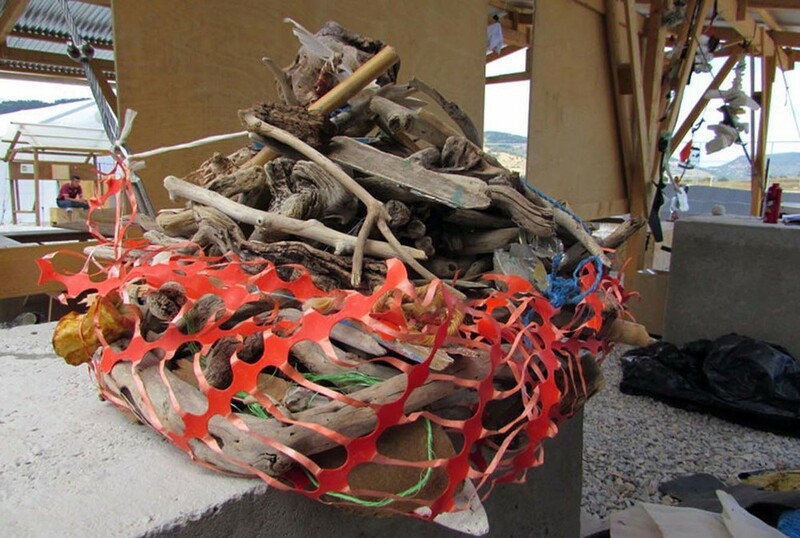 Its hull is made from the orange barrier fencing and is filled with driftwood (see slideshow). Said Longobardi, “As one Afghan boy was helping me carry the materials to our workspace, I saw that I could simultaneously contain the driftwood in a net and make a ‘boat’ by sewing up the two ends with pieces of plastic fishing line and rope… I saw [the boat] as a complete analogy to the refugee crossing. The driftwoods, being natural material of nature, were the refugees, transported to new land/possibilities on a plastic boat that was full of holes, and leaky." At least that boat was safely at port, but who knows where these people will drift next? It was hard to leave behind these young people, though we had known them for only a few hours. Yet it was also hard not to feel hope and deep respect for the refugees and for the many islanders across Greece who had participated in the rescues. These islanders are themselves struggling from the effects of the migration — particularly a 90 percent drop in the islands’ tourism industry. The irony of Lesbos’ own possible future is not lost on many islanders. Climate change and economic collapse in Greece has accelerated out-migration from all the Greek islands, while at least one of the refugees we met was planning to stay in Lesbos, having found work creating tote and messenger bags out of the literal mountain of life vests deposited on the island. The human ecology of the island itself is transforming, as these drifters, castaways and cast-offs from their own homes, seek a new one. Jennifer Wagner-Lawlor is Associate Professor of Women's Studies and English at Penn State University. Top:  “Lifevest Wave,” 2016, Pam Longobardi. Above photos by Jennifer Wagner­-Lawlor.